HARDIN COUNTY — I am writing this Ag and Natural Resources Update in anticipation of a few more drying days. 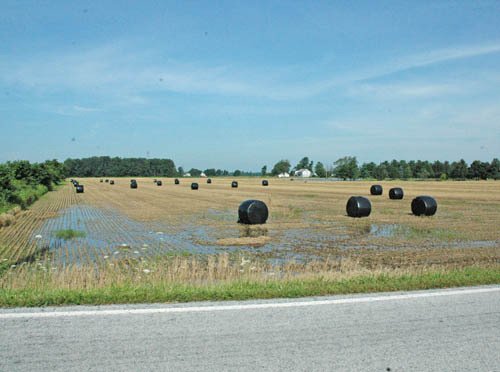 This summer we have received the highest amount of rain in June according to our Hardin County OSU Extension Township Rainfall Reporters who have been keeping track of precipitation locally since 1993. The wettest June on record in our office was June 2009, which had an average of 8.46 inches of rain for the month. In the month of June 2015, Extension rainfall reporters recorded an average of 10.99 inches of rain in Hardin County. Last year, the average rainfall for June was 5.52 inches. Rainfall for June was 6.79 inches more for the month than for the ten year average rainfall in the month of June. For more township rainfall information, see the attached June 2015 rainfall summary. This abundance of rain has had a great effect on the crops and gardens. Now with the excessive rain and increased humidity, we need to be on the lookout for diseases. Weeds are becoming a major issue as well, so gardeners will need to stay on top of this problem too. Remember to stay well hydrated by drinking plenty of water when working outside in this hot and humid weather. This past week there were a total of eight Western Bean Cutworm moths caught in the four traps I have placed around the county. This is an increase over the previous week, but not yet at threshold levels. As more corn comes into tassel, we should expect to see more Western Bean Cutworm moths in flight as we are approaching the mid-season for this corn pest. Most of the highest concentration of these moths have been in the northern corners of the state in previous years, but they are starting to make their way across Ohio. If you are interested in hops production and missed the registration deadline for the Wooster event, there is another Hops Production Field Night being held at OSU South Centers in Piketon if you are willing to travel. There will be a Vegetable Crops Field Night in Fremont on Aug. 6 at the North Central Agricultural Research Station. Locally, Austin Heil from Homestead Precision Agriculture is hosting an ‘Unmanned Aerial Systems VIP Training Class’ at the Christian Missionary Alliance Church in Kenton on Aug. 21 from 8:30 a.m. to 2:30 p.m. Other upcoming local events include a Master Gardener meeting on Monday, July 27, starting at 7 p.m. at Harco Industries.